American Pit Bull Bronze Ornament. Our American Pit Bull ornament is hand cast in bronze - and gorgeous rendition of this wonderful breed. 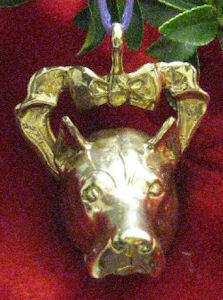 The American Pit Bull ornament is cast with a 3-dimensional head, hollowed out behind, and placed upon a bronze "ribbon" with a bow. The ornament has an eyehook for hanging from an actual ribbon. The head is approximately 1 3/4" wide. Please allow 2 weeks for delivery - ornaments are all hand cast in the USA. Ornaments normally ship within 5-7 days. Hawaii, Alaska and International Customers - please contact us for ordering and shipping cost information.